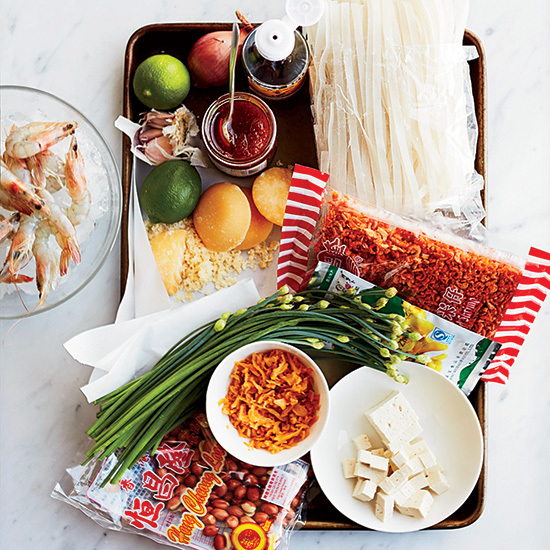 Pad Thai may be a favorite takeout dish, but two chefs show how to make a much, much, much better version at home. "A good pad Thai is all about balance, but a lot of times you get goopy, overly sweet noodles," says chef Ann Redding, who grew up in Thailand and now cooks Thai food at Uncle Boons in New York City; she opened the place last year with her husband, chef Matt Danzer, after the two met at Per Se. According to Redding, the keys to great pad Thai are high heat and speed—both of which are impossible to achieve if you try to cook too much at once. "You want the noodles to absorb the sauce as quickly as possible so they don't become gummy," she explains. At Uncle Boons, that means cooking no more than two portions at a time in a wok, over a flame powerful enough to launch a rocket. Because burners at home aren't nearly as intense and tend to not work well with woks, Redding suggests making one portion at a time in a large skillet. Cook Shrimp: Sauté the head-on shrimp over moderately high heat, turning, until white throughout. Stir-Fry Aromatics: Add the tofu, garlic, shallot and preserved radish and cook until golden. Add Sauce and Noodles: Toss the noodles and Pad Thai Sauce in the pan until the liquid is absorbed. Scramble Egg: Quickly stir in the beaten egg, along with the chives, until cooked through.